Discover the endless possibilities of handmade silk wedding invitations, wedding folder, silk folios, linen invitations, lace invitations and high end wedding boxes with rhinestone brooches featuring silk, velvet and linen. Prestige Creations is a factory in Chiang Mai, Thailand designing and manufacturing high end wedding invitations, wedding boxes, boxed wedding invitations, wedding stationary and unique silk gift bags since 2006. Their creative products have been exported to all over the world with big wholesale demand in USA, Australia, UAE and South Africa. Prestige Creations Co.,Ltd. has a passion to permanently create new wedding invitations and has been setting trends in the wedding invitation industry ever since. 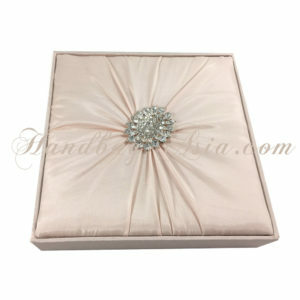 Silk favor boxes and velvet favor boxes are by far the most luxury favor you can deliver to you clients. You can place them onto the dining table or hand deliver them to each guest personally. 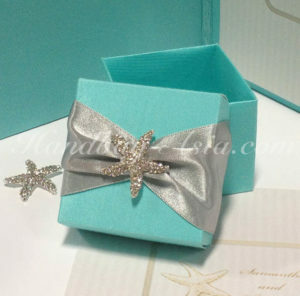 Prestige Creations is proud to present their unique favor boxes that come in bright silk colors and embellished with the most beautiful rhinestone brooches you can imagine. 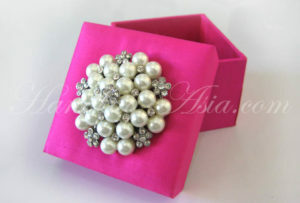 Or keep it classy with this pearl brooch embellished silk favor box in square shape. The look and feel of this favor box design is simply amazing. The large ivory pearl brooch stands in perfect contrast to the fuchsia pink silk. Just imagine you can invite guest to your wedding event or formal gala party with silk covered or velvet covered high end invitation boxes embellished with a large rhinestone brooch, pearl brooch or handmade ribbon bow. The impression your to be invited guest will have is priceless. Prestige Creations is designing some of the most famous silk invitation boxes and velvet wedding boxes on the market with over 1000 designs featured on their private product catalogue. Sometimes you need to plan your wedding on a budget but still can’t get enough of silk invitations. 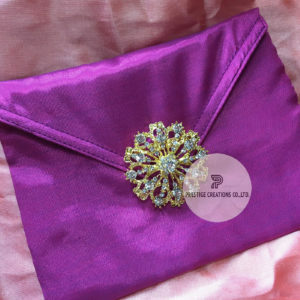 Silk envelopes and silk wedding pouches are cheaper but still look just amazing and luxury enough to be used for your wedding invitation cards. Below are some examples of how beautiful silk envelopes can look like. Handmade wedding pocket folder, silk folder and wedding invitation folio designs should not be forgotten. The features are the same in compartment to wedding boxes, but since folder are easier to create and require less material cost their prices are cheaper than invitation boxes and allow you to spend the left over budget on other wedding accessories. Silk folder usually come with a pocket on the left size and either silk corner holder or ribbon holder on the right side. RSVP cards are placed into the pockets while the main wedding or event invitation card goes to the right side. Silk folders are usually placed in handmade cardboard mailing boxes to be posted to the guest. 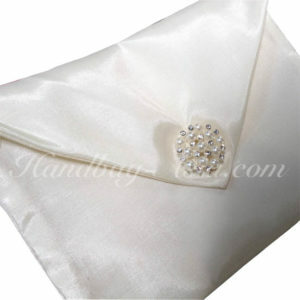 A great example is this ivory dupioni silk wedding invitation pocket folder with padded exterior, large rhinestone brooch that is attached to double faced station ribbon in cappuccino color. Besides silk fabrics velvet is commonly used for couture wedding invitations like velvet gatefold invitations. 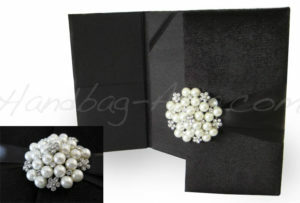 Below we show you a black velvet folder in gatefold design that is embellished with a large pearl brooch. We recommend personalized bridesmaid gifts like personalized cotton cosmetic bags and silk cosmetic bags that can be remembered and are useful. Nobody wants to give away bridesmaid gifts nobody can use. 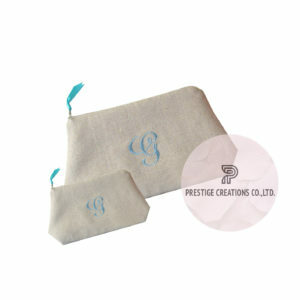 We feature two of the most elegant and yet timeless bridesmaid gifts available. Today everything should somehow be environment friendly, with personalized cotton cosmetic bags that feature your name, monogram or a little logo you can do nothing wrong. With Prestige Creations you can create custom wedding invitations, announcements, beautiful handmade bridesmaid gifts and luxury couture invitations that stand out. A dedicated sales team will assist during the order process and create a product you will love.